In most instances, a diagnosis is easily established because of the distinctive, central umbilication of the dome-shaped lesion. Pseudocystic molluscum contagiosum, giant molluscum contagiosum, and molluscum contagiosum associated with other lesions may be more difficult to diagnose clinically. 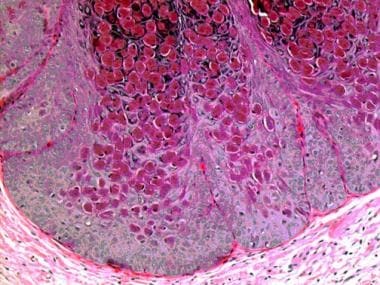 If diagnosis is uncertain, lesions may be biopsied. 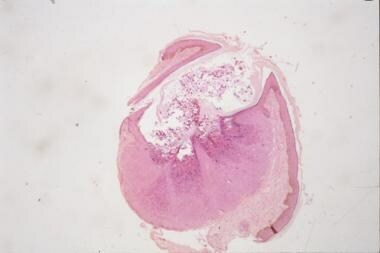 Characteristic intracytoplasmic inclusion bodies (molluscum bodies, or Henderson-Paterson bodies) are seen on histologic examination findings. Express the pasty core of a lesion by crushing the lesion between 2 microscope slides and staining it to reveal the particulate virions, which are present in abundance. Firm compression between the slides is required to release the virions with the stain in place. The use of crystal violet, safranin, and ammonium oxalate in 10% ethanol; the Papanicolaou test; or Wright, Giemsa, or Gram stains can reveal the virions that make up the Henderson-Paterson bodies. Measure serum antibodies by complement fixation, tissue culture neutralization, fluorescent antibody, and gel agar diffusion techniques; however, they are not well standardized and are seldom used except in research protocols. Polymerase chain reaction (PCR) assay can be used to detect and categorize molluscum contagiosum virus in skin lesions. Evaluate the patient for other sexually transmitted diseases (STDs) because sexually active patients may acquire other concomitant venereal diseases, such as syphilis and gonorrhea. Always consider testing for HIV infection in patients with facial lesions. Squash preparation is microscopic examination of cellular exudate. 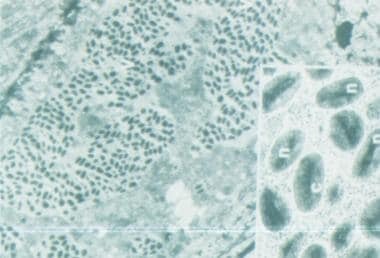 The cellular material contained within the central umbilication may be extracted manually, flattened between 2 microscope slides, and stained. Microscopic examination of this preparation reveals the Henderson-Paterson bodies. 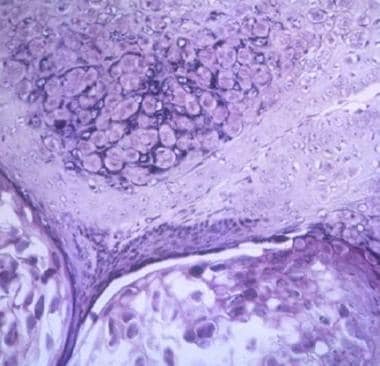 Lesions in molluscum contagiosum have a characteristic histopathology. 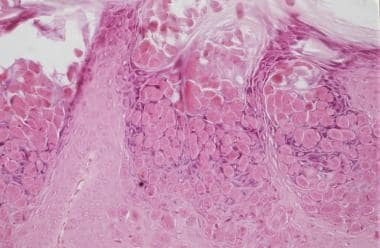 The prototypical hematoxylin and eosin (H&E)–stained histologic section in this disease reveals a cup-shaped indentation of the epidermis into the dermis (as seen in the images below). Downward proliferation of the rete ridges with envelopment by the connective tissue forms the crater. Within the region of the indentation, the epidermis appears thickened (acanthosis), possibly measuring up to 6 times the thickness of the surrounding, uninvolved skin, and the cornified layer typically is disintegrated. 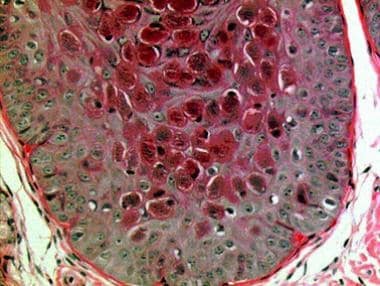 The striking feature is the presence of intracytoplasmic, eosinophilic, granular inclusions within the keratinocytes of the basal, spinous, and granular layers of the epidermis. In nonprototypical cases of molluscum contagiosum, in which intradermal rupture of molluscum bodies occurs, an intense, inflammatory dermal infiltrate consisting of lymphocytes, histiocytes, and occasional foreign body–type, multinucleated giant cells may be observed. Rarely, metaplastic ossification may occur. 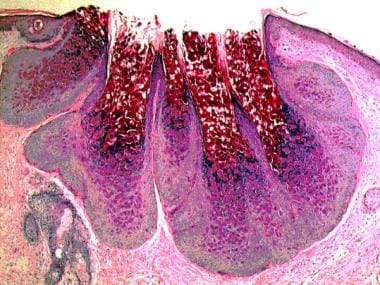 Exceptionally, the inflammatory dermal infiltrate may be intense enough to simulate a cutaneous lymphoma (pseudolymphoma).